Old wood deck disposal. Is it time or can you save it and give it new life? While that old wood deck might look like it’s done for good, there usually a saving-grace waiting for its revival. All you need to do is assess it’s true condition and then you can determine if it’s salvageable, or if it’s time to disassemble it and junk it for good. Then, you can either replace it or repurpose the space for a different use. 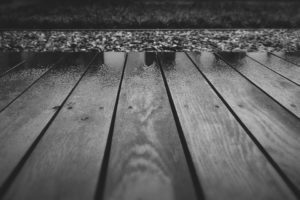 Now, if it’s really showing signs of serious wear and tear, it’s probably time to take it apart and either replace it with a new wood deck or go with another fixture. Should this be the case, you’ll need to dispose of the demolition debris. To make this easy, just have a junk hauling service come and pick it all up and take it away. Don’t put that wood out on the curb because that’s where it will stay, since it’s coated with sealant, paint, full of nails, screws, bolts, and more. You can’t make a bonfire out of it, either since that’s too dangerous. (The treated wood contains hazardous materials.) So, don’t go with that wild idea and do not go the illegal dumping route since that’s just too big a risk. Replace damaged boards. Next, remove and replace any damaged boards. Pile the old planks in an out of the way space so they aren’t a tripping hazard. Be sure the replacement wood is pressure treated so it can withstand the outside elements. Give it a really good cleaning. Clean it off with water and detergent so it’s free of dirt and debris. Let it dry and then you can seal and stain it to give it a refreshed look. Seal the deck and stain to finish. After it’s clean and free of any dirt and debris, you can then apply a coat of sealant, along with paint or stain to finish it. For an old wood deck disposal, go ahead and phone 800-433-1094 or visit Junk Garbage Removal.